Hydrodemolition is a technique that uses a high-pressure water jets to remove areas of loose, deteriorated and damaged concrete from structures and buildings. Examples are bridges, pillars, dams, quays, parking garages, airports, power plants and other engineered constructions. Hydrodemolition meets the latest European EN 1504 standards for repairing and replacing of concrete. The Hydrodemolition process produces a “craggy” profile in the concrete. This craggy surface provides a greater area for bonding, resulting in a significantly stronger bond than can be achieved with the use of jackhammers, milling machines or other mechanical removal methods. Another advantage is that the sound concrete remains unaffected by the Hydrodemolition process. Micro cracks and damage to rebars caused by the impact of jackhammers or other mechanical removal methods are no longer a concern. 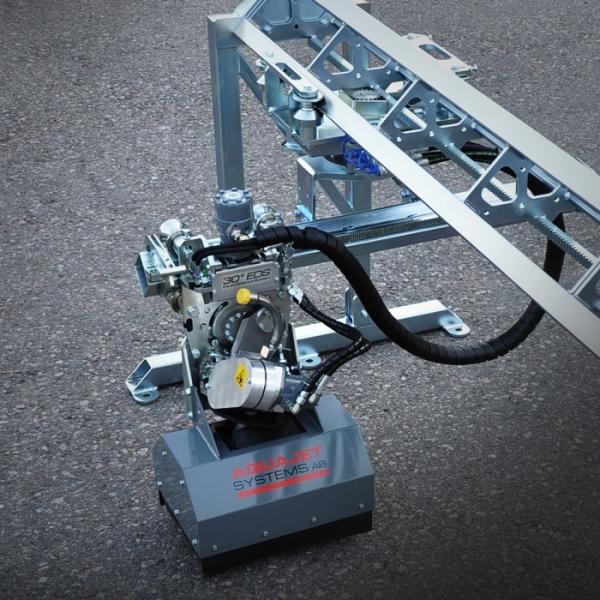 Basic Hydrodemolition equipment usually consists of an automated programmable robot, connected with flexible line to a high-pressure unit. The robot works automatically on the desired surface removing selected concrete areas. The key element of Hydrodemolition is to pressurise and widen existing pores and micro cracks in the weakened concrete structure using high-pressure water penetration. Material is removed as the build-up pressure exceeds the tensile strength of the concrete that have to be removed. In addition to the water pressure, the volume of water is also a contributing factor to the systems efficiency. The rate of removal, for example, is not only dependent of the water pressure but also on the amount of water directed towards the concrete surface in order to rapidly and continuously pressurise the areas being treated. This combination of water pressure and flow together with the precise robotic controlled movements of the water jet nozzle creates the necessary effect criteria for the Hydrodemolition process. AQUA CUTTER robots operates using an easily programmed automated control system, which optimizes the settings and applies only the minimal required force. The robot works selectively, with its high-pressure jet of water penetrating into the weak concrete as it passes across the surface. The jet breaks up the damaged concrete and flushes it away. All that is then needed is a final clean up to remove debris and water, leaving the clean, rough surface ready for concreting. The high-pressure water is delivered to the robot through a flexible high-pressure hose. The water travels down a lance where it meets a nozzle, whose opening is sized according to the pressure and flow requirements. A lance manipulates the jet as it leaves the nozzle and can either oscillate or rotate, depending on the type of removal required. No other suppliers of Hydrodemolition equipment can integrate these key factors as effectively as Aquajet Systems, thanks to its innovative Intelligent Sensing Control system together with its patented high-pressure lance control. Water jets accomplish their destructive force on concrete by means of three separate processes: direct impact, cavitations and pressurization of micro and macro cracks. The nozzle is moved rapidly and continuously over the area to be removed. Jet efficiency is maximized when the jet itself is stable, and stability is influenced by the machine design, distance from the nozzle to point of impact, the shape and configuration of the nozzle, the water exit speed, the jet’s movement and the angle of attack. As if that were not enough, you can use our products under water. Selective removal is one of the basic principles of Hydrodemolition. It means that you only remove the amount of concrete needed for the refurbishment. Basically you leave the “good concrete” and the steel reinforcements undamaged. With our products you can remove selected concrete surfaces to a preset quality depth, leaving a jagged or craggy surface that provides an extensive bonding area for the new concrete. Our robots are very compact but also big enough to handle the toughest applications. Their versatility enables Hydrodemolition operations in the most difficult situations. Use of tracks makes the machines easy to manoeuvre across any terrain. 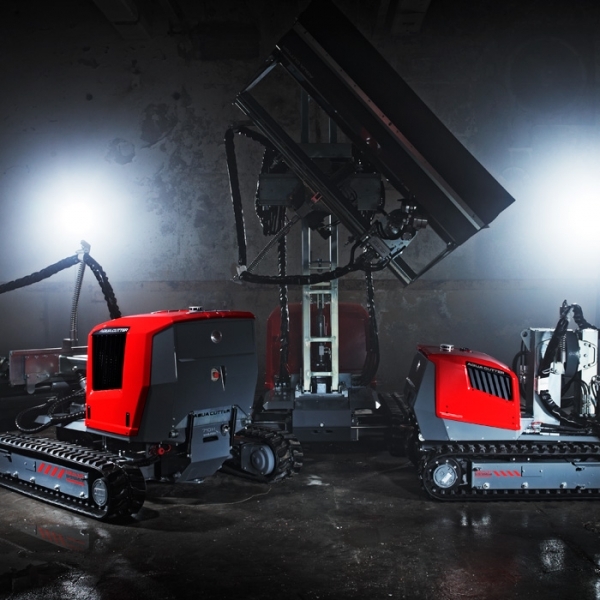 No other Hydrodemolition robots on the market can offer the same flexibility. 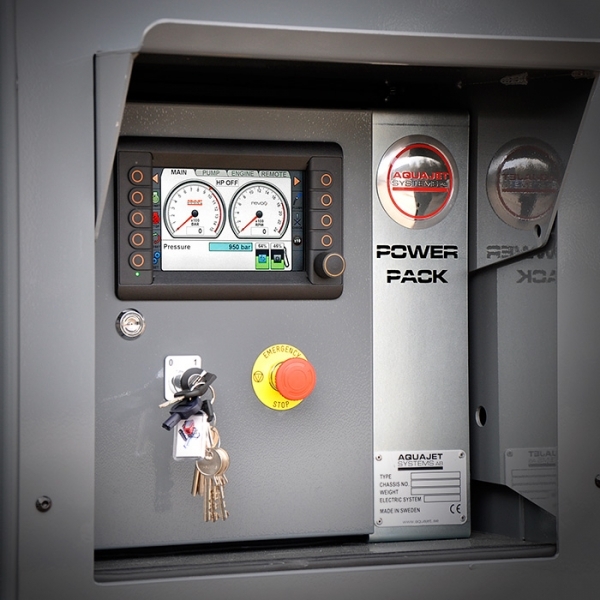 Our multi-axis system enables fast 3D positioning of the front power head so that the unit can be rapidly put to work on any vertical, curved or horizontal surface. Hydraulically controlled side shifting of the power head offers better reach and easier operation in confined spaces and the power head can be quickly tilted and turned for vertical and ceiling demolition, with no need for additional equipment. The easy to extend tower system has proved its versatility; it’s fast and makes it easy to fit the required numbers of sections to reach the desired operation height, whether it’s for vertical or over-head removal. The robot only needs the tower sections required for the operational task. No folding arms or other unnecessary protruding items get in the way during operation. Some nations require that all Hydrodemolition specialists pass specific tests before concrete repairs or concrete renovations begin on any public structures. The tests are performed on specially designed slabs of concrete to determine if the equipment and operators can perform selective Hydrodemolition to the required standards. 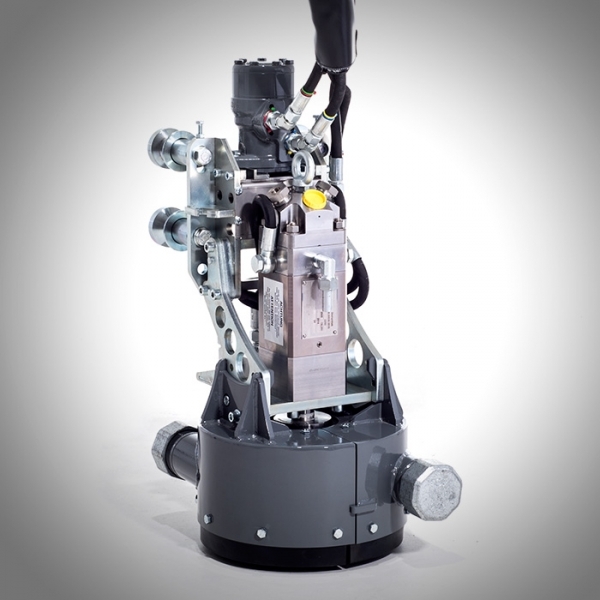 Aquajet’s Hydrodemolition robots have performed and been approved according to all standards.